A typical day in Janine D’Elia’s science class starts off with a warmup to activate her students’ knowledge, segues into the lesson plan of the day, and wraps the day up with an activity. This allows her students to be actively engaged and always moving in the classroom, which she said she hopes is a fun place to be. 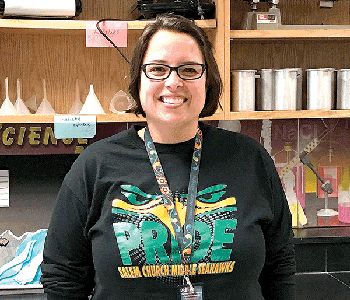 D’Elia has been teaching middle-school science for 17 years, 10 of which have been at Salem Church Middle School where she teaches eighth grade and was named the school’s 2015 Teacher of the Year. She has always taught middle school and though she sees high school as a possibility, she loves teaching middle schoolers. She has always had a love for science and wants to extend her learning and love of the subject to her students. 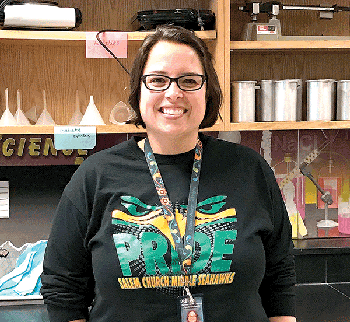 In addition to being the science teacher, D’Elia also sponsors the National Junior Honor Society, a service organization at the Salem Church that supports programs in the school and around the community. She has also taught in Velocity, a program for students who needed additional support to stay on track and most of the students who visit her are from that program. She said it is rewarding to see her former students. “Sometimes I’m invited to high school graduations and that is amazing for me because I teach them in eighth grade and then they leave,” she said.